A writer expresses ideas, experiences, and emotions through words. Under the right conditions, those words might grow into a nonfiction book, a poem, a blog post, or (no pressure) the Great American Novel. In order to complete any of those projects, a writer must transform inspiration into a writing habit. Some days that task is easier than others. Most days, I have plenty to say. (Ask anyone!) However, I don’t necessarily write it down, at least not EVERY day. 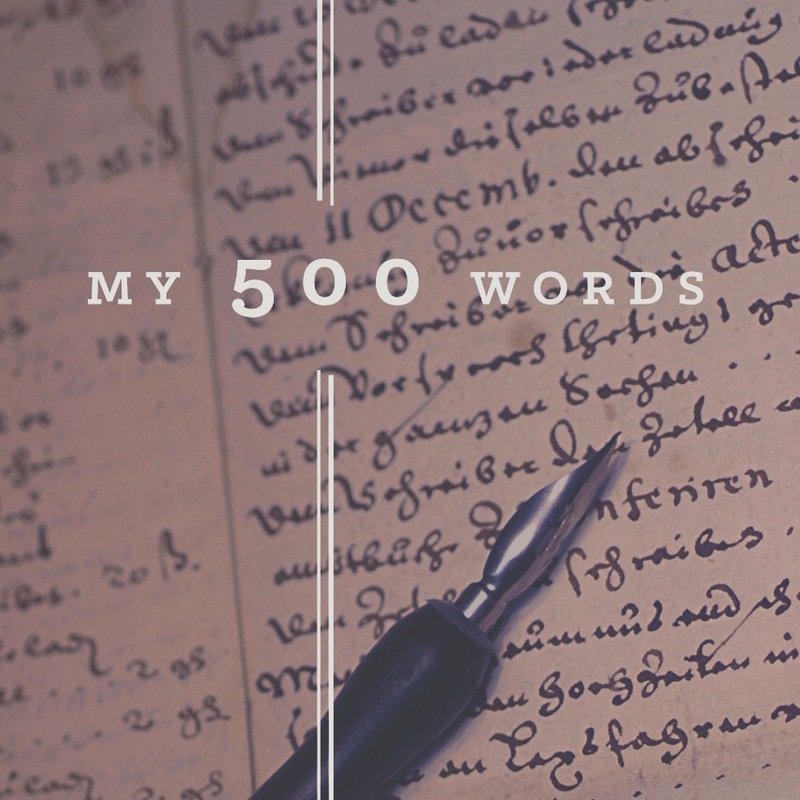 In hopes of boosting my productivity, I accepted Jeff Goins’ My 500 words: A Writing challenge. (I received a deluge of self-improvement advice early this year. Read more in this post.) This challenge provides daily prompts, a Facebook group for accountability and support, and a reason to sit down and pound out those words. Are you intrigued? Click the link below for more information. Click here to learn more about Jeff Goins My 500 words challenge. At first, most participants find words flow effortlessly. The resulting feeling of euphoria fuels a veritable fountain of prose. Word counts mount and glowing updates dot the Facebook feed. I cannot cite a scientific explanation for this phenomenon, perhaps the process releases a subconscious blockage. A backlog of repressed ideas bursts out of the psyche like water rushing through a broken dam. My advice? Enjoy this honeymoon period, but do NOT be lulled into a false sense of security. Don’t be surprised when honeymoon ends. For some reason-on or around day fifteen-word output slows to a trickle. Inspiration evaporates. The prose fountain sputters and stops. The daily goal becomes an unattainable mirage in the distant parched desert landscape. Even I, who wrote an entire post about capturing ideas, hit the wall. I felt as if I’d explored every thought, opinion, or topic that had ever illuminated the tiny, dim bulb over my head. My mood turned dark. I felt tired, restless, and grouchy, and I wasn’t the only one. When you reach this point, do not despair! How do you write 500 words when you have nothing to say? For goodness sake, don’t stare at that blank page. Your muse will nap, check her e-mail, or binge watch cat videos. (NO, that does NOT count as research.) You can attempt to jolt her into action by taking a walk in the woods, gazing out the window, or giving her a stern lecture. However, if those tactics don’t succeed, you must get back to the basics. Creatives require the proper atmosphere, equipment, and support. If Dumbo (at least the in the 1941 animated version) needed a magic feather to fly, how can a writer expect to soar without the correct paper. Do NOT attempt to write another word before you have satisfied ALL of the following requirements. Do you prefer to write by hand? Assemble the necessary tools. Do you use pencil, pen, marker, crayon, or blood? Yellow legal pad, scratch paper, loose leaf (college or wide ruled), spiral ring notebook or expensive leather journals? Get what you need. Settle into your preferred location. Whether it’s a park bench, coffee shop, kitchen table, cozy den, or sunny beach, you know where you NEED to be. GET THERE. Once you’ve arrived, carefully arrange the above-mentioned writing equipment. Did you remember your favorite beverage? Coffee, tea, wine, beer, margaritas, type of milk-almond, soy, cow, or type of water-fizzy, bottled, tap, flavored, or maybe some type of soda-diet, cola, root beer. No? Put a pin in the whole 500 words idea until you remedy that situation. Maybe you should bring two, it may be a long session. Mood incorporates all things regarding your physical comfort- appropriate temperature, proper lighting, or a supportive chair. Reset, rearrange, and reorganize until everything is just right-it worked for Goldilocks. Mood also refers to your emotional comfort. Have you selected an appropriate playlist? You may need the structure of classical music, the pounding energy of heavy metal, or the spiritual tickling of new age chords to inspire your creativity. Believe me, a song is worth a thousand words…sorry, maybe that’s a picture. Also, the volume must be properly adjusted. Select the proper headphones, Bluetooth speakers, or ear plugs. If the music is too loud it will be disruptive, to you and your neighbors. Singing along is optional. Next, and now you are really making progress, read your warm-up prompt. If you don’t have a fresh writing/inspirational prompt, you may wish to search for one. Query your favorite internet browser or dig through your writing book library. Do you mind if I sing along with the playlist while I wait? You’ve created the ideal writing environment, now, strike the pose. Take a deep breath, center your thoughts, poise your pencil over the paper or fingers over the keyboard. Remember you also want to LOOK like a writer, especially if your chosen location is a coffee shop. Do not be alarmed if you experience a few false starts. Feel free to cross out, delete, and/or crumple sheets of paper and toss them around the room. Several rounds of this process are considered normal and ALL words count toward your daily total. I’m happy to report that I successfully completed the challenge. If you choose to participate, I suggest you bookmark this post. When your inspiration lags, reread and implement my helpful suggestions. Then all you’ll need are five hundred words! Good luck! Thanks! It was a great learning opportunity!